This is an article that I wrote for Civil War Times about six years ago. It was never published as the focus wasn't exactly what the editor wanted. 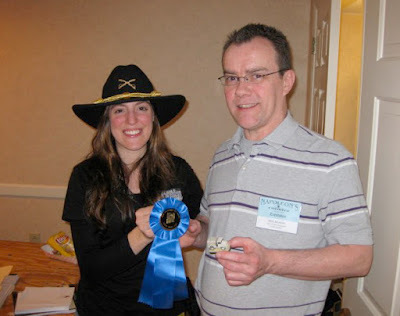 A second try was more successful and was published in CWT a few years later. Though usually unnamed, most of the greatest Civil War battles have occurred on bedroom floors, tabletops, and backyard gardens. Fearsome phalanxes of plastic toy soldiers have engaged in mortal (if only temporary) combat, generaled by generations of boys, and occasionally girls, to triumphant victory, staggering defeat, or the unsatisfying stalemate that is precipitated by bedtime. The children of the post-World War Two era were the beneficiaries of the abundance of cheap and versatile plastics developed during that conflict. Companies such as Lido, Ideal, Topper, Remco, and Marx were manufacturing a variety of Civil War-themed toys in an abundance prompted by the Civil War Centennial of the early 1960s. In the closing years of the 1950’s, toy magnate Louis Marx released the first Civil War play set marketed through the Sears catalogue. Marx figures were remarkable in their day for detail, sculpting, and the animation of the realistic poses. The Marx “Blue and Gray” play set was a wonder of fun. The set included an exploding bunker, antebellum mansion, boulders, trees, a horse-drawn limber, cannons and seacoast mortars (that fired little projectiles) fences, breastworks, horses, an army ambulance, and armloads of 54mm scale toy soldiers molded in plastic of blue or gray. A focal point of nearly every tabletop or bedroom floor battle was the plastic Burnside Bridge – style bridge that completed the set. Presented with this playset on my 10th birthday I was the envy of all my friends, and the bane of their parents as the nagging began; and soon more and more boys were showing up at school with five or six Marx “Civil War guys” in their grimy pockets. I was typical of many boys of that generation who began a lifetime interest in the American Civil War. Now, that same generation of older, sometimes wiser, paunchy and world-weary baby-boomers frequently find themselves scouring the screens of eBay hoping to score a little piece of their childhood. Most of those beloved Marx figures have been recast and are now available from many toy soldier vendors. Newer companies including Toy soldiers of San Diego, Barzo, Replicants, BMC, Conte, and the aptly-named Armies in Plastic carry on the tradition with exciting new poses with, in most instances, superior sculpting and animation compared to the old Marx figures, but usually at premium cost. John Zabawa’s shop Gettysburg Miniatures Soldiers provides the full range of toy solders from the inexpensive BMC/Americana line to the very high-end miniatures including W. Britains and King and Country. Although these are called "miniatures, rather than toy soldiers, I still happily play with them. In business for the last 14 years John, like many others, first became interested in the Civil War when he received that classic book “The Golden Book of the Civil War” with its fascinating battle maps populated with tiny soldiers, evocative of toy soldiers. 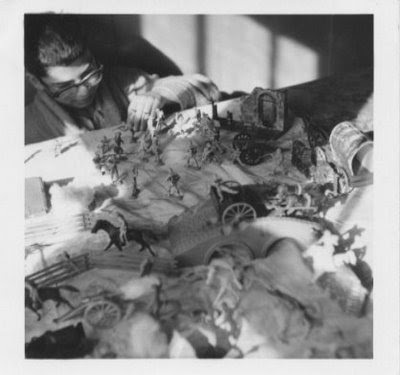 At age 10 John was presented with the Lois Marx Blue and Gray playset, and he has been immersed in the world of toy soldiers ever since. Of those children, one in particular, is emblematic of the new generation of toy soldier enthusiasts: Michael Logan Thomas. Thus far the emphasis has been on men and boys as the primary interest group for toy soldiers, but to exclude girls would, in fact, be quite hasty. Meet 31-year-old Christin Sciulli, a self-described “true geek girl, who has always been drawn to gaming and collecting toy soldiers." Since the 1960s the hobby has changed, seeing the range of Civil War toy soldiers increase in quality, availability and in price. What is unchanged however is the joy found in setting up and knocking down these little plastic men in miniature battlefield dramas just as they have been for generations. In Christin and Michael Logan one can see the torch being passed from the Centennial generation to that of the Sesquicentennial era. Despite the distractions of electronic gaming, and technology-based toys, young people and children are still happy to marshal their plastic and metal legions, both blue and gray, and soldier on into the future. Toy soldiers, happily, will endure.